LOS ANGELES (AP) — Matt Kemp of the Los Angeles Dodgers and catcher Robinson Chirinos of the Texas Rangers have been ejected in the third inning after a home plate collision that led to a benches-clearing confrontation between the teams. With two outs, Enrique Hernandez singled to right and Kemp tried score from second Wednesday night. Chirinos caught a pinpoint throw by Nomar Mazara and had his glove out to tag Kemp. Kemp barreled into Chirinos with his arms up, leading with his shoulder. 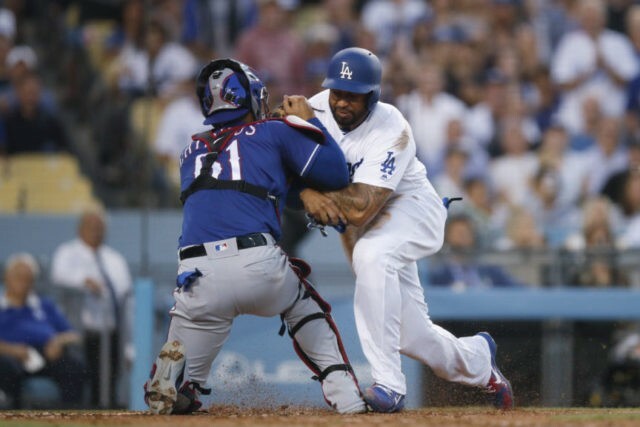 Chirinos’ helmet flew off as he got knocked over and Kemp fell, too.